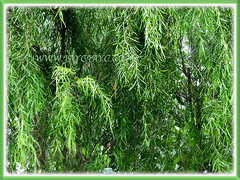 Chinese Weeping Willow or Babylon Willow is an amazing tree with their unusual and pendulous branches and long tresses of leaves swaying gracefully in a breeze. Weeping refers to the way raindrops stream down the branches, dripping ‘tears’ from the tips. Hence, this beauty is a very popular tree planted at cemeteries and memorial gardens. 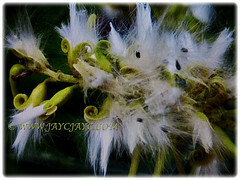 Botanical Name: Salix babylonica (syn. : Salix matsudana). 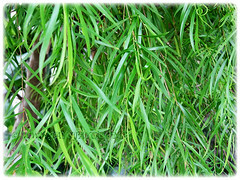 Common Names: Weeping Willow, Peking Willow, Chinese Weeping Willow, Babylon Weeping Willow, Babylon Willow. 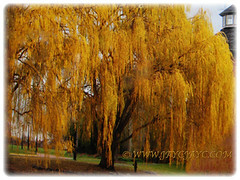 Etymology:The genus Salix is an ancient Latin name for willows. The specific epithet babylonica means of Babylon. Origin: Native to Northern China. Plant type: An ornamental tree with pendulous branches covered with long tresses of leaves. 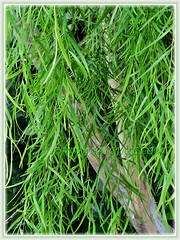 Features:Salix babylonica is from the genus, Salix that consists of about 450 species of deciduous trees and shrubs. It is a fast-growing medium to large tree that grows up to 18 m tall and spread as wide. It has a stout trunk with greyish-black bark and an open crown of wispy and ground-sweeping branches. Leaves are lance-shaped with an acuminate tip and hang on pendulous branchlets. Smooth and hairless leaves are light green above and grey-green below with their finely toothed leaf margins. Leaves, measuring 4-16 cm long and 0.5-2 cm broad are spirally arranged along the branches. Reddish branches are subdivided into many pendulous stems that reach the ground. Green and female flowers lack petals. Male flowers are small. 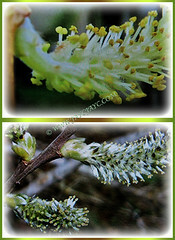 Flowers are dioecious and arranged in catkins. Seeds are borne in capsules, about 1.27 cm long and slightly green to yellow in colour. When the seed capsule bursts, it becomes enveloped in a white, cottony seed mass that will quickly float away with the slightest breeze. 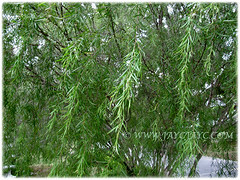 Culture (Care): Salix babylonica or Chinese Weeping Willow can be easily grown with minimum care. Light: Best in full sun though can tolerate partial shade. Moisture: High water needs. Water regularly and thoroughly. Soil: Prefers slightly fertile, moist, acidic to alkaline and well-drained soils. However, it’s also tolerant of a wide variety of soils and pHs. Others: Prune the Weeping Willow tree regularly to keep it healthy and attractive as well as to assist the tree to build a strong branch structure. Best to prune tree when young to maintain a single-trunked tree. Trim off its branch tips especially those that are touching the ground over time. Since the tree is somewhat brittle and can be susceptible to wind damage, it should be trained to have wide branch crotches to help prevent breakage. Feed once fortnightly with a balanced fertiliser for foliage plants at ½ strength. Generally free from serious pests and disease problems. However, its foliage is prone to fungal diseases such as black canker, willow blight and crown gall. Also, do watch out for caterpillars, borers, gypsy moth, powdery mildew, scales and aphids. For subtropical and temperate regions: Hardiness: USDA Zone 6-8. 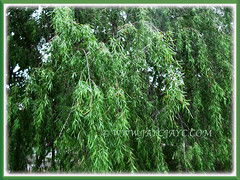 Salix babylonica or Chinese Weeping Willow is a medium to large deciduous tree and is not frost tender. It features silvery green foliage in summer and turning golden-yellow in autumn before dropping, adding fall interest. Its yellow catkins appear in spring. Best to prune your tree with reddish-brown bark in late winter when it is dormant before it starts its spring growth. Propagation: Easily propagated by stem cuttings. It can be propagated from seeds but may not produce an exact replica of the parent tree. Seeds will germinate if planted immediately after collection. 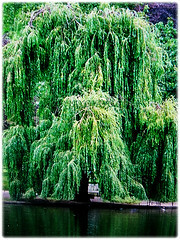 Usage: Salix babylonica or Babylon Willow is a large tree that is excellent for screening or as a focal point in the garden. It is a landscape tree that is popularly planted at cemeteries and memorial gardens. An ideal plant along streets and sidewalks. Besides, it is used for weaving wicker baskets, timber and reforestation as well as grown for wood production and shelterbelts. 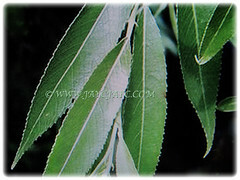 It is traditionally used by the Chinese as medicine whereby they use the bark to treat fever and rheumatoid arthritis. The bark contains salicylic acid which is the key ingredient of aspirin. Moreover, it has phytoremediation potential as it accumulates ethanol and benzene. It is sometimes used for erosion control since it has a well-developed root system.